Elyès Jouini graduated from the Ecole normale supérieure and ranked first at the aggregation de mathématiques. He is professor of Mathematics with endowed Chair (Risk Foundation-Groupama) at the University of Paris-Dauphine, director of the Institut de Finance Dauphine, head of the “Asset management” master and vice-president of the Université Paris-Dauphine Scientific Council. He served previously as professor at the Université Paris 1 Panthéon-Sorbonne and at the ENSAE (National School of Statistics and Economics) and as visiting associate professor at the Stern School of Business. His research is at the interplay between mathematics, economics and finance. Elyès is fellow of the Institut universitaire de France and has received the Best Young French Economist Prize (Le Monde and Cercle des economists) in 2005 for his research in Economics as well as the Finance and Sustainability European Research Award for an article he co-authored and published in Management Science. He is the scientific advisor for the Europlace Institute of Finance. He is a member of the National Commission for long-term nuclear projects and wastes valuation (attached to the French Government), of the Steering Committee of the Finance Innovation cluster. He is Board member of the COMAR (Insurance, Tunisia), of the Banque de Tunisie and of the Risk Foundation. He also served as member of the Economic Analysis Council (attached to the French Prime Minister) and of the High-Council for Science and Technology (attached to the French President). Elyès is co-founder and life-member of the Bachelier Finance Society. He also founded and has been the first Editor in Chief of Mathematics and Financial Economics. He has published widely, about 60 articles, in top Economics, Mathematics and Finance academic journals. He co-edited several books as the Handbooks in Mathematical Finance (Cambridge Univ. Press, with J. Cvitanic and M. Musiela, 2001), or the Paris-Princeton Lectures on Mathematical Finance (Springer-Verlag, 2002, 2003, 2004, 2010). 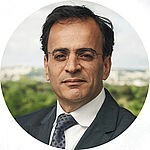 Elyès Jouini has shortly served in 2011 as Member of the Tunisian Transition Government (Minister in charge of the Economic and Social Reforms and of the coordination between the different concerned ministers). He is Chevalier de la Légion d’Honneur.